Cancellation: Due to inclement weather, tonight’s Star Party at Wagman Observatory has been canceled. Our last Wagman Star Party of 2017 will be Saturday, Nov 4, weather permitting. If we get the amount of rain predicted or more, the hilltop could be very sloppy. It’s a primarily matter of safety. Please consider another AAAP Star Party scheduled this evening at Mingo Observatory in Washington County. The Saturday, October 28, Wagman Star Party starting about 6:25 PM EDT. Enjoy the views of large clusters of stars, beautiful colored double stars, visit the craters of the moon and view the planets Saturn, Uranus and Neptune through the telescopes at the Observatory and much more. This invitation to amateur astronomers, students and the general public is part of AAAP’s annual series of star parties occurring March – November at the Wagman and Mingo Observatories. These events are family friendly. There is no charge for these events, although donations are appreciated. Read more about Star Parties here. Regardless of your experience or ability level you will be welcome to join the throng of avid sky watchers. Perhaps you have a telescope and do not know how to use it? Bring it along and members of the AAAP will help! Likewise if you are considering a telescope purchase or the addition of accessories, star charts and books Wagman is a good place to start. Members of the AAAP will help! The Star Parties will be held WEATHER PERMITTING. The public should call 724-224-2510 for more information. The Nicholas E. Wagman Observatory is located in Deer Lakes Regional Park, Frazer Township, Pa., near the village of Russellton in northeastern Allegheny County and some 18 miles from Pittsburgh. Coordinates: Latitude 40.627 degrees N, Longitude 79.813 degrees W. Map and Directions under the About Tab at www.3ap.org and here. Admission is free, though we gladly accept donations to cover the cost of operation. To reach Wagman Observatory, follow the Orange Belt (accessible from Routes 8 and 28) to Deer Lakes Park, near Russellton. Follow the road through the Park for 1.2 miles and turn left on to the Observatory grounds. Please use parking lights only when you drive through the gate. In the observing rooms or near the outside telescopes please avoid use of bright lights: cell phones, white lights or flashlights, glow sticks, etc. and especially no flash photograph. There is no smoking permitted anywhere on the site. Planning for next year? 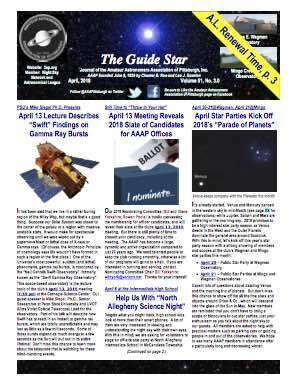 Wagman Observatory’s 2018 Star Party Dates have been published. For updates, check back here and AAAP Facebook or phone the observatory, 724-224-2510, the night of the event. Wagman Observatory Clear Sky Chart. AAAP will hold two November Observatory Star Parties in November: November 4 at Wagman observatory and November 11 at Mingo Observatory. Our 2018 Schedule of Observatory Star Parties is available on the website as well as below. Is the event tomorrow night, October 14, 2017? The calendar says 10/14, but your narrative site does not, but the observatory chart for the sky says 10/14. 10/14 was for Mingo. The last 2017 Star Party at Wagman is set for Saturday, Nov. 4. I see now that 10/14 is for the Mingo Creek Park location.